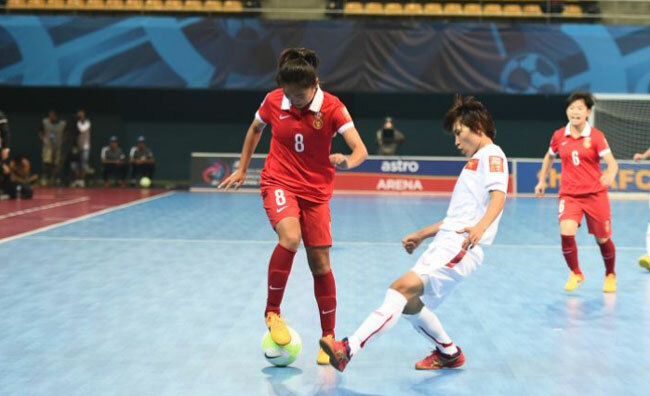 HA NOI (VNS) — Viet Nam national women's futsal team lost to China 2-3 in the second match of Group B of the 2015 AFC Women's Futsal Championship in Nilai, Malaysia yesterday. In the first match on Monday, Viet Nam lost to Japan 2-4, while China lost to Thailand 1-3. Futsal is a form of indoor football played on a hard surface with five players per side. So both Viet Nam and China tried their best in this match to earn a ticket to compete in the next round. In the 19th minute, Liu Jing opened the scoring for China. Viet Nam fought back strongly with two goals of Pham Thi Tuoi and Nguyen Thi My Anh. However, with better skills, China scored two more goals in the second half to end the match at 3-2. "We played much better than yesterday and I wasn't afraid after Viet Nam went up 2-1, even though our team is new and only recently organised. Japan is a powerhouse in Asian futsal but we will try our best to beat them tomorrow," China's coach Shan Zhiping was quoted as saying on the website the-afc.com. Meanwhile, Viet Nam's coach Truong Quoc Tuan said their players played well and created so many chances but in futsal, it is who scores that wins. "We created many chances but our finishing was poor, although at times I think we were not lucky," Tuan said. In another match played later, Japan defeated Thailand 3-2. With two losses, the door to semi-finals nearly closes to Viet Nam team. Today, Viet Nam will meet Thailand in their final match of the group stage, while China face tournament favourites Japan, who were Asian Indoor Games gold medalists in 2007, 2009 and 2013.